3:00–6:00pm Sat 10 Nov 2018 — Opening reception to celebrate the life and work of Peter Konsterlie in the University of Bridgeport’s Schelfhaudt Gallery in the Arnold Bernhard Center at 84 Iranistan Ave, Bridgeport CT 06604. This exhibition celebrates the life and works of Peter Konsterlie. Peter was the Gallery Director of the Schelfhaudt Gallery for 5 years and a well-loved Professor of Art History at U.B. for the past 15 years. He passed away suddenly at age 55, on August 13, 2018. He received his BA from the Minneapolis College of Art and Design. As Director of the University’s Schelfhaudt Gallery, he produced exemplary exhibitions for the school and broader community. His dedication and inspiration within the Shintaro Akatsu School of Design at the University of Bridgeport will be deeply missed. Peter was a prolific and passionate visual artist. He brought a unique perspective to his paintings, integrating several visual styles from pop art to abstract expressionism. His drips of paint combined with spray paint formed patterns, becoming a structure on the canvas for his metaphysical themed Abstracts. Peter Konsterlie had several solo and group exhibitions in the United States and abroad, most notably The Aldrich Contemporary Museum, Minneapolis Institute of Art, The Plains Art Museum, Carnegie Mellon, Washington D.C., Sarah Bowen Gallery in Williamsburg, NY, Housatonic Museum, Claire Oliver Gallery, N.Y, and most recently at the Drawing Center Viewing Program in New York City. Konsterlie’s work has been purchased and leased for feature film productions, and television productions such as the Blue Bloods with Tom Selleck, and on the ABC news program 20/20 with John Stossel. Funds are being raised towards an endowment in his name to support the Schelfhaudt Gallery. Donations may be made via https://give.bridgeport.edu/ or (203)576-4542. Please visit http://www.backward.us/pk/index.htm to see more of Peter Konsterlie’s work. Please come and bring friends and family. All are welcome! Complimentary refreshments will be served for your enjoyment. The reception is free and open to the public. 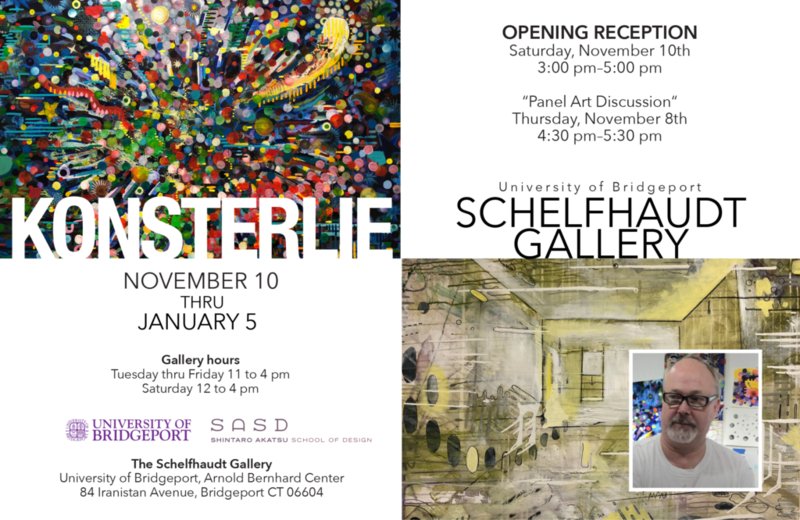 The exhibition runs through January 5. Gallery hours are Tuesday through Friday, 11 a.m. to 4 p.m.; and Saturday, 12 to 4 p.m. If you are interested in visiting and cannot make our hours, please call 203-240-7333 to schedule an appointment. Groups visits by appointment; please see the Contact page to book your visit by email.